Heat a large non-stick skillet over medium heat. Add 1 tablespoon olive oil. Dice chicken into bite-sized pieces. Toss with ginger, salt, and pepper. Add to skillet and cook, stirring often, until browned and cooked through, about 7 minutes. Remove chicken to plate and set aside. Add 1 tablespoon olive oil to pan and stir in diced onion, garlic, and peas and carrots. Cook until onions are translucent and vegetables are warm, about 7 minutes. Remove vegetables to plate with chicken and set aside. Add remaining tablespoon of olive oil to pan over medium heat. Add rice and stir to coat. Cook, stirring occasionally, 5 minutes until rice is warmed through. Push rice to the side of the pan. Crack eggs into the empty section of the pan and drizzle with 1 teaspoon of soy sauce. Scramble the eggs until done. Stir eggs into the rice mixture, return chicken and vegetables to pan, top with remaining soy sauce and sriracha. Stir well, cooking for 5 more minutes. Remove from heat and sprinkle with green onions before serving. It’s 6pm. You’re just now realizing that you didn’t plan anything for dinner. I totally know the feeling. You really don’t want to go to the grocery store, or even to pick up takeout. You’re kind of tired of eating cereal for dinner. Instead of picking up the phone, go check your fridge. 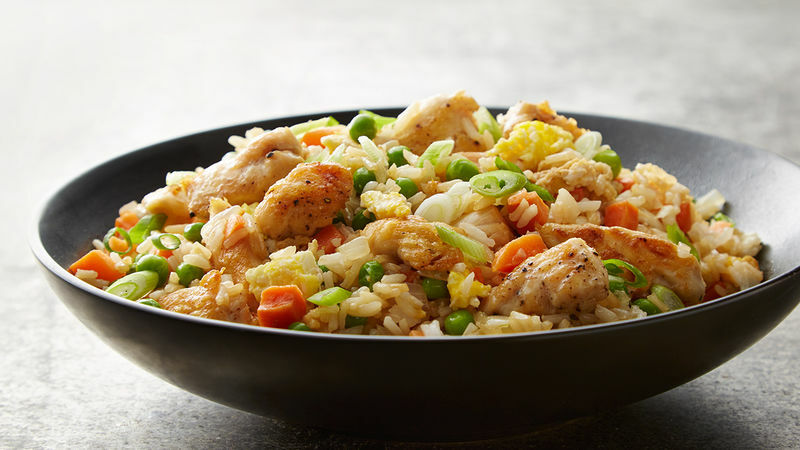 I’ll bet you have everything you need for this easy Chinese chicken fried rice all ready to go. I mean, maybe not the cold rice, but I’ll share my little trick for that. No worries. Just whip up some microwaveable rice and pop it in the freezer for 20 minutes to chill while you start the chicken. It’s not going to be quite as good as day-old rice, but it’ll do in a pinch. Dice up some chicken into little chunks. Toss it with some salt, pepper and ground ginger. Cook all that up until it’s nice and golden. Remove to a plate and set aside. Dice up some onions and garlic and add those to the hot pan with some frozen peas and carrots. Cook that up until it’s good and hot, and then add it to the plate of chicken. Add your rice to the hot pan and let it cook around for a bit before moving it out of the way and cracking in some eggs. Drizzle the eggs with some soy sauce and start scrambling them up. Once your eggs are cooked, everything goes back in the pan to get cooked together with a bit of soy sauce and sriracha. Way quicker than ordering take out!